"Proud Maiden" is the ninety-first episode of the Yu-Gi-Oh! VRAINS anime. It first aired in Japan on February 27, 2019. Through the data of his battles up to now, Bohman has adopted even stronger strategies, and with his evolved "Hydradrive" monsters he drives Blue Maiden into a corner. However, Blue Maiden refuses to give up, and keeps on fighting. With her conviction remaining unbroken, what kind of tactic will Blue Maiden use?! Blue Maiden sets "Marincess Sea Horse" in the Link Arrows to Link Summon "Marincess Blue Slug" (1500/↓). As it is the same Attribute as "Cubed Hydradrive Lord", the effect of "Lord" negates the effects of "Blue Slug". As a "Marincess" monster was Normal or Special Summoned to a zone that "Marincess Crystal Heart" points to, the effect of "Marincess Bubble Blast" activates, inflicting damage to Bohman equal to the Link Rating of the targeted monster and the monsters linked to it times 500, but the effect of "Interference Canceller" makes the damage 0. As she controls two or more "Marincess" Link Monsters, Blue Maiden activates the effect of the "Marincess Mandarin" in her GY, Special Summoning it (100/100) in Attack Position. Its effects are negated by "Lord". "Bubble Blast" activates, but the damage is reduced to 0 by "Interference Canceller". Bohman activates the effect of the "Hydradrive Mutation" in his hand, returning a face-up Continuous Trap Card on his field to his hand to Special Summon "Mutation", then Set a Continuous Trap from his hand, which can be activated this turn. He returns "Interference Canceller" to Special Summon "Mutation" (0/0), Set and then activate "Interference Canceller" again, targeting the co-linked "Lord". Blue Maiden Sets "Blue Slug" and "Mandarin" in the Link Arrows to Link Summon "Marincess Coral Anemone" (2000/←↓). Its effects are negated by "Lord". "Bubble Blast" activates, with "Interference Canceller" reducing the damage to 0. Blue Maiden Sets a card. During the End Phase, the effect of "Bubble Blast" destroys itself. Bohman activates the effect of "Mutation", letting him change its Attribute to that of another monster on the field. He changes it to the WATER Attribute of "Crystal Heart". Bohman then activates "Property Flood", Tributing a "Hydradrive" monster to target a "Hydradrive" Link Monster he controls with the same Attribute and Special Summon "Hydradrive" Link Monsters from his GY with the same Attribute as the Tributed monster, up to the targeted monster's Link Rating. The Summoned monsters will have their effects negated, they cannot attack, and they will be destroyed during the End Phase. He Tributes "Mutation", targets "Lord", and Special Summons three copies of "Coolant Hydradrive" (1000). Bohman sets his four "Hydradrive" Link Monsters with the same Attribute in the Link Arrows to Link Summon "Tesseract Hydradrive Monarch" (3000/←↙↘→). When it is Special Summoned, its Attribute is also treated as WATER, FIRE and WIND. The effect of "Lord" activates as it was sent to the GY as a Link Material, letting Bohman draw a card. The effect of 'Monarch" negates the effects of monsters with the same Attribute as it, so "Coral Anemone" has its effects negated, but "Crystal Heart" is unaffected as long as it is in the Extra Monster Zone. "Monarch" attacks "Crystal Heart", but Blue Maiden activates the effect of "Crystal Heart", sending a "Marincess" monster from her hand to the GY to prevent its destruction by battle and prevent the battle damage. She sends "Marincess Crown Tail". The effect of "Monarch" activates, as it attacked, forcing Blue Maiden to send a monster from her field with the same Attribute as "Monarch" to the GY, then "Monarch" can attack a monster again. Blue Maiden activates her face-down "Marincess Cascade", banishing all "Marincess" Link Monsters she controls until her next Standby Phase, then increasing the ATK of all monsters on the field equal to the total Link Rating of the banished monsters until the end of the turn. She banishes "Crystal Heart" and "Coral Anemone" ("Monarch": 3000 → 4200). The effect of "Monarch" resolves with no effect as there is no target. Bohman Sets a card. During the Standby Phase, "Crystal Heart" and "Coral Anemone" return to the field, with "Monarch" negating the effects of "Coral Anemone". Blue Maiden activates the Field Spell Card, "Marincess Battle Ocean", increasing the ATK of all "Marincess" Link Monsters by 200 ("Crystal Heart": 0 → 200, " Anemone": 2000 → 2200). Blue Maiden sets "Crystal Heart" and "Coral Anemone" in the Link Arrows to Link Summon "Marincess Wonder Heart" (2400 → 2600/←↙↘→). 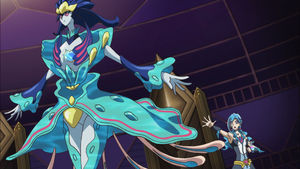 As "Crystal Heart" was used as a material for a "Marincess" Link Monster, the effect of "Battle Ocean" renders the Summoned monster unaffected by the opponent's card effects, so the effects of "Wonder Heart" are not negated by "Monarch". As a "Marincess" Link Monster was Summoned to the Extra Monster Zone, the effect of "Battle Ocean" activates, letting Blue Maiden equip up to three "Marincess" Link Monsters with different Link Ratings from her GY to it. She equips "Blue Slug", "Coral Anemone" and "Marincess Marbled Rock" to "Wonder Heart". The other effect of "Battle Ocean" increases the ATK of the equipped monster by the total Link Arrows of the monsters equipped times 300 ("Wonder Heart": 2600 → 4400). The effect of the "Coral Anemone" used as a Link Material activates as it was sent to the GY, letting Blue Maiden add a "Marincess" card from her GY to her hand. "Wonder Heart" attacks "Monarch", with "Wonder Heart" making the monster it battles unaffected by other card effects, so "Judgment Arrows" does not increase the ATK of "Monarch". "Monarch" is destroyed (Bohman: 4000 → 2600). The effect of "Wonder Heart" activates as it battled, letting Blue Maiden Special Summon one of the equipped "Marincess" monsters with its effects negated. She Special Summons "Marbled Rock" (2500 → 2700/←↓→), "Wonder Heart": 4400 → 3500). "Marbled Rock" attacks directly, but Bohman activates his face-down "Hydradrive Tolerance", targeting a "Hydradrive" Link Monster in his GY that was destroyed and sent there this turn to reduce the battle damage by its Link Rating times 300. He targets "Monarch" (Bohman: 2600 → 1100). "Tolerance" also prevents Bohman from taking further battle or effect damage until the End Phase. During the End Phase, the effect of "Wonder Heart" equips the Special Summoned "Marbled Rock" to it (4400 → 3500). Bohman activates the effect of "Monarch", paying 1000 LP to Special Summon it and double its ATK (3000 → 6000). As it was Special Summoned, it's treated as also being WATER, FIRE, and WIND Attributes. The effects of "Wonder Heart" are not negated by the effect of "Monarch" due to "Battle Ocean". "Monarch" attacks "Wonder Heart", with "Wonder Heart" making "Monarch" unaffected by other card effects, preventing the ATK increase from "Judgment Arrows". The effect of "Wonder Heart" activates as it battled, preventing its destruction and making the battle damage 0 by Special Summoning a "Marincess" Link Monster equipped to it. She Special Summons "Blue Slug" (1500 → 1700/↓), "Wonder Heart": 4400 → 4100). The effect of "Monarch" activates as it battled, forcing Blue Maiden to send a monster of the same Attribute to the GY and let "Monarch" attack again. She sends "Blue Slug" and "Monarch" attacks "Wonder Heart", with Blue Maiden Special Summoning "Coral Anemone" (2000 → 2200/←↓, "Wonder Heart": 4100 → 3500), whose effect activates, letting Blue Maiden add a "Marincess" card in her GY to her hand. She adds "Sea Horse". The effect of "Monarch" activates and Blue Maiden sends "Coral Anemone". "Monarch" attacks "Wonder Heart", with Blue Maiden Special Summoning "Marbled Rock" (2500 → 2700/←↓→, "Wonder Heart": 3500 → 2600). The effect of "Monarch" activates and Blue Maiden sends "Marbled Rock". "Monarch" attacks and destroys "Wonder Heart". During damage calculation, Blue Maiden activates the effect of the "Crown Tail" in her hand as a "Marincess" monster is battling. She can reveal "Crown Tail" and send another "Marincess" monster from her hand to the GY to halve the battle damage and Special Summon "Crown Tail". She sends "Sea Horse" (Blue Maiden: 1900 → 200) and Special Summons "Crown Tail" (600 → 800/2300) in Attack Position. The effect of "Wonder Heart" activates as it was destroyed, letting Blue Maiden Special Summon "Crystal Heart" (0 → 200) from her GY. Bohman activates the effect of "Monarch" and Blue Maiden sends "Crown Tail". "Monarch" attacks "Crystal Heart", but Blue Maiden activates the effect of the "Crown Tail" in her GY, banishing it to prevent all battle damage this turn if the amount is less than or equal to the total Link Rating of all "Marincess" Link Monsters in her GY with different names times 1000. The total Link Rating is 10, so up to 10,000 battle damage is prevented. The effect of "Judgment Arrows" doubles the ATK of "Monarch" (6000 → 12000, Blue Maiden: 200 → 0). This page was last edited on 21 March 2019, at 18:33.